Without being particularly unique, the Santa Fe Sport is one of the most attractive models in its class right now--and that's a delicate balance to strike. After an update last year, the Santa Fe Sport checks all the requisite SUV styling boxes, but without being too "out there" or polarizing to buyers who seem to really enjoy the standards SUV style. It's hard to think of a demographic this crossover wouldn't appeal to. If the Santa Fe Sport sells because of how it looks, the opposite may be true for the stylistically unique Honda CR-V. Or, perhaps we should say that the CR-V's style is not why the Honda sells in such large numbers. The CR-V isn't ugly, really, but it's quirky in ways that may not appeal to all buyers. From the side it fits into the stable of crossovers, but the front and rear look like they're having a bit of an identity crisis. The Hyundai Santa Fe Sport offers an all four-cylinder engine lineup right now, with the standard engine being a 2.4-liter unit producing 185 horsepower and 178 lb.-ft. of torque. The optional engine is a 2.0-liter turbo-four, which then puts 240 horsepower and 260 lb.-ft. at your disposal. Because the 2.0L turbo-four is so much more powerful and only a little less fuel efficient, it has to be the preferred option. The base engine in the Honda is almost identical to the standard engine in the Hyundai, so most buyers will opt for the 1.5-liter turbo-four instead. Even though that 1.5 L is a better engine than Honda's base unit, its 190 horsepower and 179 lb.-ft. is no match for the Santa Fe Sport's turbo-four. The Santa Fe Sport may be a compact crossover, but you'll find a decent amount of space inside for five people and a good amount of available cargo space too. Knee and leg room are above average in the back, although overall passenger volume in the cabin is about average for the segment. The quality and comfort is excellent though, and way better than many might expect. The interior of the CR-V is a much better selling tool for the Honda than its exterior. Honda is well-known for being masters of packaging small spaces well, and that's no different in the CR-V. The quality of the interior is better as well than it has been in years past. With a bit more passenger volume, the win here goes to the Santa Fe Sport. 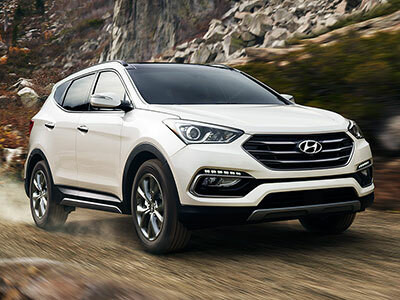 Fuel economy isn't the strongest suit of the Hyundai Santa Fe Sport, but that's because Hyundai has chosen to strike a good balance between performance and efficiency. The best ratings come from front-drive versions with the standard engine, which are 21 mpg in the city, 27 mpg on the highway, and 24 mpg combined. 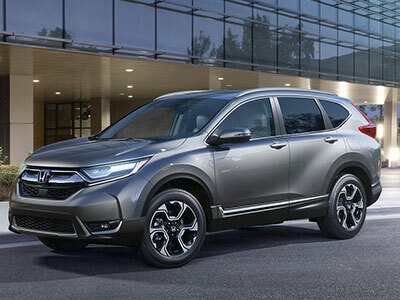 The Honda CR-V has the Hyundai beaten in this area, with the 1.5 turbo boasting EPA ratings as good as 28 mpg in the city, 34 mpg on the highway and 30 mpg combined. Even the 2.4L engines don't do much worse. If you're only looking at fuel economy and the interior, it's easy to see why the Honda CR-V sells in such big numbers. But if style and performance are equally important to you--you can live with a few miles less to the gallon--we'd say go for the 2018 Hyundai Santa Fe Sport every time, especially with that 2.0-liter turbo-four under the hood.